Car Condition: Driver This one owner, rust free, 1967 Jaguar was an amazing time capsule with incredible patina which made it an excellent candidate for cosmetic restoration and that is all that it needed. Included in the cosmetic restoration by Classic Showcase was a complete repaint, some of the chrome was re-plated, seats were restored in new blue leather and new carpet was fitted and installed. A DVD of the restoration process will accompany the car. This Jaguar was always serviced and maintained by Jaguar Professionals and comes with receipts. The car is accident free and is a good solid Jaguar. It is very reliable, and you could count on driving it every day. The brakes, the instruments, clutch, and body are all in very good condition. The handling, running, and power of the car are all perfect. It comes with the original tool kit, the original Bill of Sale, the original owner’s manual, and is also an original California Black Plates. The color is Pastel Blue with Dark Blue interior. 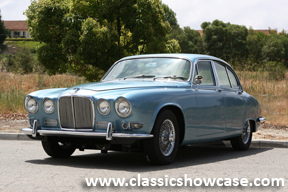 This Jaguar is truly for the collector who wants an original car that has been well preserved. This Jaguar has already proven itself in winning multiple shows. The 420 was introduced in the fall of 1967. It did not replace either the Mk2 or the “S”. It was only imported to North America as a 1967 model and production stopped in late 1968. Named “420” because it had the 4.2 liter engine, it is sometimes confused wit the “420G” which was the last version of the much larger Mk X sedan. The 420 looks like a Mk X that went on a sensible diet.